Thanks to the Gentoo Foundation and Nitrokey's discount, each Gentoo developer is eligible to receive one free Nitrokey Pro 2. To receive their Nitrokey, developers will need to register with their @gentoo.org email address at the dedicated order form. The Gentoo Foundation supports the development of Gentoo, protects Gentoo's intellectual property, and oversees adherence to Gentoo's Social Contract. After restarting your scylla server, the first and obvious thing you can try to do to get out of this situation is to run the nodetool clearsnapshot command which will remove any data snapshot that could be lying around. That's a handy command to reclaim space usually. But that's only a patch so let's go down the rabbit hole and look at the optimization options we have. By switching to uuid, we now consume 50MB of disk space: that's a 80% reduced disk space consumption compared to the naive schema for the same data! Since the Scylla 3.0 release you can use the latest "mc" sstable storage format on your scylla clusters. It promises a greater efficiency for usually a way more reduced disk space consumption! Since it's backward compatible, you have nothing else to do as new compactions will start being made using the "mc" storage format and the scylla server will seamlessly read from old sstables as well. That's a pretty cool gain of disk space, even more for the not optimized version of our schema! So if you're in great need of disk space or it is hard for you to change your schemas, switching to the new "mc" sstable format is a simple and efficient way to free up some space without effort. GNOME 3.30 is now available in Gentoo Linux testing branch. Starting with this release, GNOME on Gentoo once again works with OpenRC, in addition to the usual systemd option. This is achieved through the elogind project, a standalone logind implementation based on systemd code, which is currently maintained by a fellow Gentoo user. Gentoo would like to thank Mart Raudsepp (leio), Gavin Ferris, and all others working on this for their contributions. More information can be found in Mart's blog post. For easier GNOME install, the desktop/gnome profiles now set up default USE flags with elogind for OpenRC systems, while the desktop/gnome/systemd profiles continue to do that for systemd systems. Both have been updated to provide a better initial GNOME install experience. After profile selection, a full install should be simply a matter of `emerge gnome` for testing branch users. Don't forget to adapt your system to any changed USE flags on previously installed packages too. If you encounter issues, don't hesitate to file bug reports or, if necessary, contact me via e-mail or IRC. You can also discuss the elogind aspects on the Gentoo Forums. I'm glad to announce a new (awaited) release of py3status featuring support for the sway window manager which allows py3status to enter the wayland environment! I'm pretty sure that the title of this post will catch your attention…and/or maybe your curiosity. Well..this is something I'm doing since years…and since did not cost too much to make it in a public and usable state, I decided to share my work, to help some people to avoid waste of time and to avoid to be angry when your cloud provider does not offer the gentoo image. 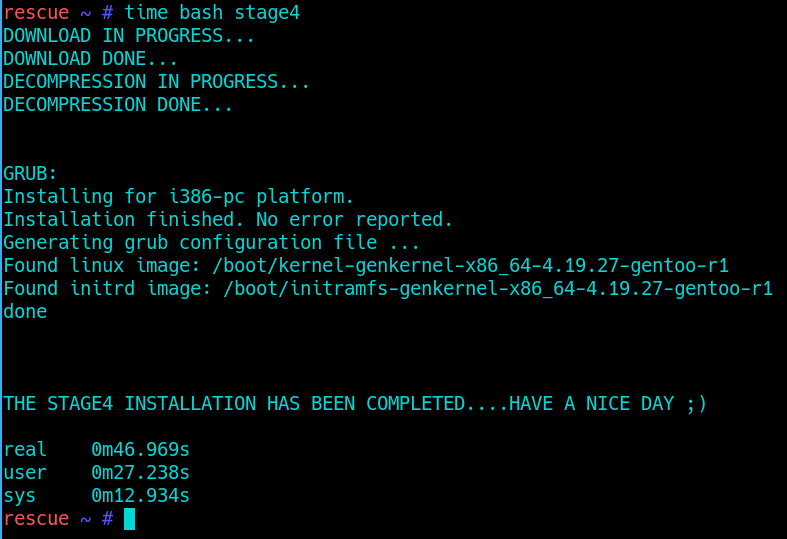 So since the stage4 has already everything to complete the installation, we just need to make some replacement (fstab, grub and so on), install grub on the disk………..and…..it's done (by the auto-installer script)! other than that pg_upgrade worked really well for me and it is now up and running agian. Traditionally, OpenPGP revocation certificates are used as a last resort. You are expected to generate one for your primary key and keep it in a secure location. If you ever lose the secret portion of the key and are unable to revoke it any other way, you import the revocation certificate and submit the updated key to keyservers. However, there is another interesting use for revocation certificates - revoking shared organization keys. Let's take Gentoo, for example. We are using a few keys needed to perform automated signatures on servers. For this reason, the key is especially exposed to attacks and we want to be able to revoke it quickly if the need arises. Now, we really do not want to have every single Infra member hold a copy of the secret primary key. However, we can give Infra members revocation certificates instead. This way, they maintain the possibility of revoking the key without unnecessarily increasing its exposure. The OpenPGP key (v4, as defined by RFC 4880) consists of a primary key, one or more UIDs and zero or more subkeys. Each of those keys and UIDs can include zero or more signature packets. Those packets bind information to the specific key or UID, and their authenticity is confirmed by a signature made using the secret portion of a primary key. Signatures made by the key's owner are called self-signatures. The most basic form of them serve as a binding between the primary key and its subkeys and UIDs. Since both those classes of objects are created independently of the primary key, self-signatures are necessary to distinguish authentic subkeys and UIDs created by the key owner from potential fakes. Appropriately, GnuPG will only accept subkeys and UIDs that have valid self-signature. One specific type of signatures are revocation signatures. Those signatures indicate that the relevant key, subkey or UID has been revoked. If a revocation signature is found, it takes precedence over any other kinds of signatures and prevents the revoked object from being further used. Key updates are means of distributing new data associated with the key. What's important is that during an update the key is not replaced by a new one. Instead, GnuPG collects all the new data (subkeys, UIDs, signatures) and adds it to the local copy of the key. The validity of this data is verified against appropriate signatures. Appropriately, anyone can submit a key update to the keyserver, provided that the new data includes valid signatures. Similarly to local GnuPG instance, the keyserver is going to update its copy of the key rather than replacing it. Revocation certificates specifically make use of this property. Technically, a revocation certificate is simply an exported form of a revocation signature, signed using the owner's primary key. As long as it's not on the key (i.e. GnuPG does not see it), it does not do anything. When it's imported, GnuPG adds it to the key. Further submissions and exports include it, effectively distributing it to all copies of the key. gen-revoke builds on this idea. It creates and exports revocation signatures for the primary key and subkeys. Due to implementation limitations (and for better compatibility), rather than exporting the signature alone it exports a minimal copy of the relevant key. This copy can be imported just like any other key export, and it causes the revocation signature to be added to the key. Afterwards, it can be exported and distributed just like a revocation done directly on the key. To use the script, you need to have the secret portion of the primary key available, and public encryption keys for all the people who are supposed to obtain a copy of the revocation signatures (recipients). The script takes at least two parameters: an identifier of the key for which revocation signatures should be created, followed by one or more e-mail addresses of signature recipients. It creates revocation signatures both for the primary key and for all valid subkeys, for all the people specified. The signatures are written into the current directory as key exports and are encrypted to each specified person. They should be distributed afterwards, and kept securely by all the individuals. If a need to revoke either a subkey or the primary key arises, the first person available can decrypt the signature, import it and send the resulting key to keyservers. Additionally, each signature includes a comment specifying the person it was created for. This comment will afterwards be displayed by GnuPG if one of the revocation signatures is imported. This provides a clear audit trace as to who revoked the key. Each of the revocation signatures can be used by an attacker to disable the key in question. The signatures are protected through encryption. Therefore, the system is vulnerable to the key of a single signature owner being compromised. However, this is considerably safer than the equivalent option of distributing the secret portion of the primary key. In the latter case, the attacker would be able to completely compromise the key and use it for malicious purposes; in the former, it is only capable of revoking the key and therefore causing some frustration. Furthermore, the revocation comment helps identifying the compromised user. The tradeoff between reliability and security can be adjusted by changing the number of revocation signature holders. This article describes the UI deficiency of Evolution mail client that extrapolates the trust of one of OpenPGP key UIDs into the key itself, and reports it along with the (potentially untrusted) primary UID. This creates the possibility of tricking the user into trusting a phished mail via adding a forged UID to a key that has a previously trusted UID. Let's say you want to send a confidential message to me, and possibly receive a reply. Through employing asymmetric encryption, you can prevent a third party from reading its contents, even if it can intercept the ciphertext. Through signatures, you can verify the authenticity of the message, and therefore detect any possible tampering. But for all this to work, you need to be able to verify the authenticity of the public keys first. In other words, we need to be able to prevent the aforementioned third party - possibly capable of intercepting your communications and publishing a forged key with my credentials on it - from tricking you into using the wrong key. This renders key authenticity the fundamental problem of asymmetric cryptography. But before we start discussing how key certification is implemented, we need to cover another fundamental issue - identity. After all, who am I - who is the person you are writing to? Are you writing to a person you've met? Or to a specific Gentoo developer? Author of some project? Before you can distinguish my authentic key from a forged key, you need to be able to clearly distinguish me from an impostor. If your primary goal is to communicate with the owner of the particular e-mail address, it seems obvious to associate the identity with the owner of the e-mail address. However, how in reality would you distinguish a 'rightful owner' of the e-mail address from a cracker who managed to obtain access to it, or to intercept your network communications and inject forged mails? The truth is, the best you can certify is that the owner of a particular key is able to read and/or send mails from a particular e-mail address, at a particular point in time. Then, if you can certify the same for a long enough period of time, you may reasonably assume the address is continuously used by the same identity (which may qualify as a legitimate owner or a cracker with a lot of patience). Of course, all this relies on your trust in mail infrastructure not being compromised. A stronger protection against crackers may be provided by associating the identity with personal data, as confirmed by government-issued documents. In case of OpenPGP, this is just the real name; X.509 certificates also provide fields for street address, phone number, etc. The use of real names seems to be based on two assumptions: that your real name is reasonable well-known (e.g. it can be established with little risk of being replaced by a third party), and that the attacker does not wish to disclose his own name. Besides that, using real names meets with some additional criticism. Firstly, requiring one to use his real name may be considered an invasion on privacy. Most notably, some people wish not to disclose or use their real names, and this effectively prevents them from ever being certified. Secondly, real names are not unique. After all, the naming systems developed from the necessity of distinguishing individuals in comparatively small groups, and they simply don't scale to the size of the Internet. Therefore, name collisions are entirely possible and we are relying on sheer luck that the attacker wouldn't happen to have the same name as you do. Thirdly and most importantly, verifying identity documents is non-trivial and untrained individuals are likely to fall victim of mediocre quality fakes. After all, we're talking about people who hopefully read some article on verifying a particular kind of document but have no experience recognizing forgery, no specialized hardware (I suppose most of you don't carry a magnifying glass and a UV light on yourself) and who may lack skills in comparing signatures or photographs (not to mention some people have really old photographs in documents). Some countries don't even issue any official documentation for document verification in English! Finally, even besides the point of forged documents, this relies on trust in administration. This one I'm mentioning merely for completeness. OpenPGP keys allow adding a photo as one of your UIDs. However, this is rather rarely used (out of the keys my GnuPG fetched so far, less than 10% have photographs). The concerns are similar as for personal data: it assumes that others are reliably able to know how you look like, and that they are capable of reliably comparing faces. An interesting concept is to use your public online activity to prove your identity - such as websites or social media. This is generally based on cross-referencing multiple resources with cryptographically proven publishing access, and assuming that an attacker would not be able to compromise all of them simultaneously. A form of this concept is utilized by keybase.io. This service builds trust in user profiles via cryptographically cross-linking your profiles on some external sites and/or your websites. Furthermore, it actively encourages other users to verify those external proofs as well. This identity model entirely relies on trust in network infrastructure and external sites. The likeliness of it being compromised is reduced by (potentially) relying on multiple independent sites. Most of time, you won't be able to directly verify the identity of everyone you'd like to communicate with. This creates a necessity of obtaining indirect proof of authenticity, and the model normally used for that purpose in OpenPGP is the Web of Trust. I won't be getting into the fine details - you can find them e.g. in the GNU Privacy Handbook. For our purposes, it suffices to say that in WoT the authenticity of keys you haven't verified may be assessed by people whose keys you trust already, or people they know, with a limited level of recursion. The more key holders you can trust, the more keys you can have verified indirectly and the more likely it is that your future recipient will be in that group. Or that you will be able to get someone from across the world into your WoT by meeting someone residing much closer to yourself. Therefore, you'd naturally want the WoT to grow fast and include more individuals. You'd want to preach OpenPGP onto non-crypto-aware people. However, this comes with inherent danger: can you really trust that they will properly verify the identity of the keys they sign? I believe this is the most fundamental issue with WoT model: for it to work outside of small specialized circles, it has to include more and more individuals across the world. But this growth inevitable makes it easier for a malicious third party to find people that can be tricked into certifying keys with forged identities. The fundamental problem in OpenPGP usage is finding the correct key and verifying its authenticity. This becomes especially complex given there is no single clear way of determining one's identity in the Internet. Normally, OpenPGP uses a combination of real name and e-mail address, optionally combined with a photograph. However, all of them have their weaknesses. Direct identity verification for all recipients is non-practical, and therefore requires indirect certification solutions. While the WoT model used by OpenPGP attempts to avoid centralized trust specific to PKI, it is not clear whether it's practically manageable. On one hand, it requires trusting more people in order to improve coverage; on the other, it makes it more vulnerable to fraud. Given all the above, the trust-via-online-presence concept may be of some interest. Most importantly, it establishes a closer relationship between the identity you actually need and the identity you verify - e.g. you want to mail the person being an open source developer, author of some specific projects rather than arbitrary person with a common enough name. However, this concept is not established broadly yet. This article shortly explains the historical git weakness regarding handling commits with multiple OpenPGP signatures in git older than v2.20. The method of creating such commits is presented, and the results of using them are described and analyzed. Two py3status versions in less than a month? That's the holidays effect but not only! Do you wonder what's gonna be in the 4.0 release? Do you have ideas that you'd like to share? Do you have dreams that you'd love to become true? It's FOSDEM time again! Join us at Université libre de Bruxelles, Campus du Solbosch, in Brussels, Belgium. This year's FOSDEM 2019 will be held on February 2nd and 3rd. Our developers will be happy to greet all open source enthusiasts at our Gentoo stand in building K. Visit this year's wiki page to see who's coming. So far eight developers have specified their attendance, with most likely many more on the way! It's been almost one month since I had the chance to attend and speak at Scylla Summit 2018 so I'm relieved to finally publish a short write-up on the key things I wanted to share about this wonderful event! I will follow up on this statement to highlight the things I heard and (hopefully) understood during the summit. I hope you'll find it insightful. Incremental compaction is also very promising as this background process is one of the most expensive there is in the database's design. I also noticed that the current version was not supporting SSL enabled clusters to store its configuration. So I directly asked Michał for it and I'm glad that it will be released on version 1.3.1. The goal here is to be able to run both on the same cluster by giving users the ability to assign "SLA" shares to ROLES. That's basically like pools on Hadoop at a much finer grain since it will create dedicated queues that will be weighted by their share. For instance, Materialized Views are updated asynchronously which means that while we can interact and put a lot of pressure on the table its based on (called the Main Table), we could overwhelm the background work that's needed to keep MVs View Tables in sync. To mitigate this, a smart back pressure approach was developed and will throttle the clients to make sure that Scylla can manage to do everything at the best performance the hardware allows! ScyllaDB has been relying on the Datastax drivers since the start. While it's a good thing for the whole community, it's important to note that the shard-per-CPU approach on data that Scylla is using is not known and leveraged by the current drivers. The ScyllaDB guys of course couldn't avoid the Kubernetes frenzy so Moreno Garcia gave a lot of feedback and tips on how to operate Scylla on docker with minimal performance degradation. Kubernetes has been designed for stateless applications, not stateful ones and Docker does some automatic magic that have rather big performance hits on Scylla. You will basically have to play with affinities to dedicate one Scylla instance to run on one server with a "retain" reclaim policy. Support for "mc" sstables (new generation format) is done and will reduce storage requirements thanks to metadata / data compression. Migration will be transparent because Scylla can read previous formats as well so it will upgrade your sstables as it compacts them. Materialized Views, Secondary Indexes and filtering will benefit from the work on partition key and indexes intersections to avoid server side filtering on the coordinator. That's an important optimization to come! Last but not least, I've had the pleasure to discuss with Takuya Asada who is the packager of Scylla for RedHat/CentOS & Debian/Ubuntu. We discussed Gentoo Linux packaging requirements as well as the recent and promising work on a relocatable package. We will collaborate more closely in the future! The tar format is one of the oldest archive formats in use. It comes as no surprise that it is ugly - built as layers of hacks on the older format versions to overcome their limitations. However, given the POSIX standarization in late 80s and the popularity of GNU tar, you would expect the interoperability problems to be mostly resolved nowadays. This naturally raised more questions on how portable various tar formats actually are. To verify that, I have decided to analyze the standards for possible incompatibility dangers and build a suite of test inputs that could be used to check how various implementations cope with that. This article describes those points and provides test results for a number of implementations. Please note that this article is focused merely on read-wise format compatibility. In other words, it establishes how tar files should be written in order to achieve best probability that it will be read correctly afterwards. It does not investigate what formats the listed tools can write and whether they can correctly create archives using specific features. I'm happy to announce this release as it contains some very interesting developments in the project. This release was focused on core changes.